Splash pages, you gotta love 'em. A blank canvas where the artist can hit you with a large dose of illustrated 'wow'. This week, I wanted to tip the hat to an artist who benchmarked fine art in mainstream comics, before mainstream comics were proud to be fine art. Bill Sienkiewicz was the Daredevil of the 80's, and so too was Matt Murdock. As the likes of Jock, Simone Bianchi and David Mack have todays publishers beating a path to their door, Bill was the man who showed the big guns these were styles they needed to visit. Not only did his work take colour, composition and positive and negative space in directions you'd never read about in How To Draw Comics The Marvel Way, his work on characters like Elektra or The New Mutants brought the trippy music videos of the decade to print. His art rattled your senses. 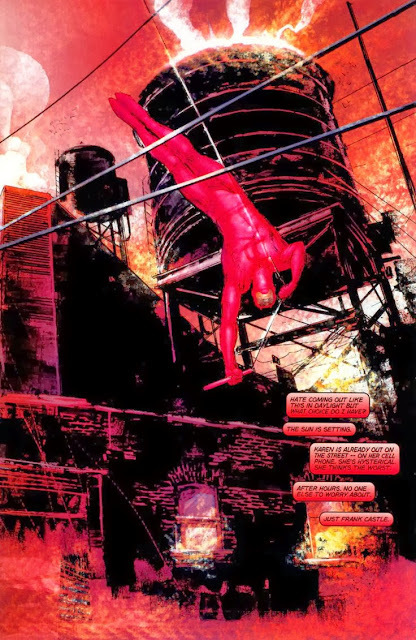 Sometimes you had to fill in the blanks, which made his work a perfect match for the guardian devil of Hell's Kitchen, work that still holds it's ground today.